A new chapter in the rich history of the Parisian stadium will be written during the European Athletics Championships. It will be given a new lease of life with a new track and various modernizations, especially for this event. Originally built in 1939 on the initiative of Sébastien Charléty, the chief education officer of Paris, to house the Paris University Club, this stadium has forged its legend through athletics competitions and exploits achieved on the track. Michel Jazy broke the 2,000 m world record there in 1962. In 1980, another world record fell to another French athlete, Philippe Houvion, who achieved 5.77 m on the pole vault. 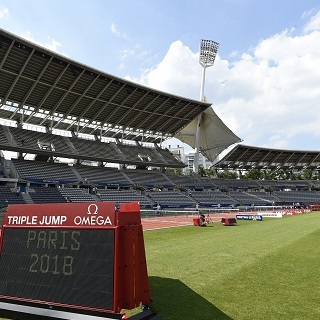 Even after its reconstruction and its inauguration in 1994 at the IAAF Grand Prix Final, Charléty has remained a stadium – the second largest in Paris – where athletics is king. It has hosted a string of international competitions (European Cup in 1999, DécaNation from 2000 to 2005 , Paris Diamond League meetings since 2017). Its track is renowned for being one of the fastest in the world. After its demolition in 1989, the reconstruction of the Charléty stadium began in 1991 and was completed three years later. Architects Henri and Bruno Gaudin designed a multi-sports complex which, besides an athletics stadium that regularly hosts soccer and rugby games, also includes a sports hall (Salle Charpy), specialized rooms, tennis and squash courts. The French Athletics Federation and the French National Olympic Committee have taken up residence nearby, which makes Charléty and its surroundings the focal point of French sports. In spring 2019, before the Paris Diamond League meeting, Charléty’s facelift will get started with the laying of a new track. Its modernization will continue ahead of the 2020 European Athletics Championships in Paris to make it an even better venue to host future major international events. Moreover, its resident club, Paris FC, currently playing in the French second division, will continue to play its home games there after 2020. The Charléty stadium is located in central Paris, in the 13th arrondissement.